Ever wondered what's like to learn a short culinary course in Le Cordon Bleu ? 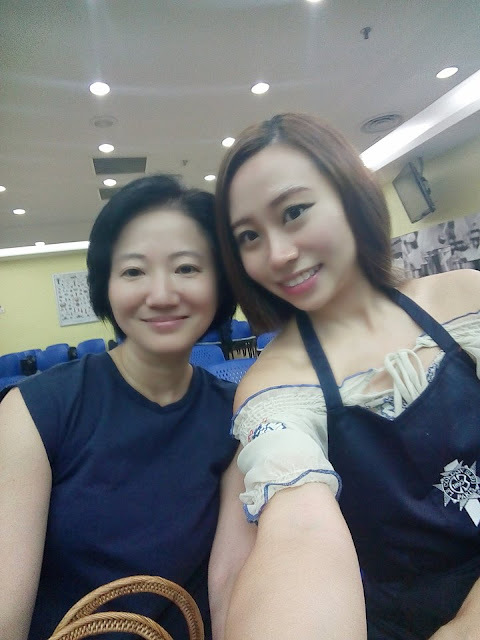 This year 2017, would be a great opportunity for you if you are interested to learn how to make fancy gourmet in Malaysia and honestly the price is very worth it ! 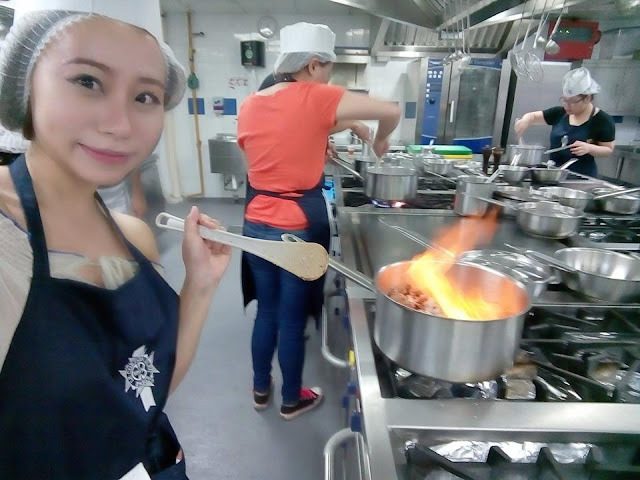 So, Why you should study or learn at Le Cordon Bleu ? 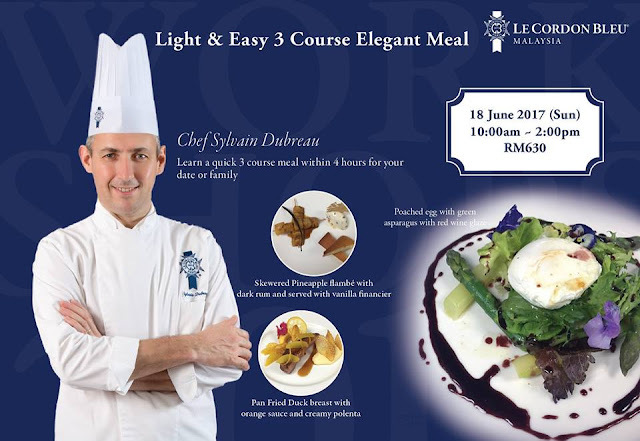 At these workshops, you will be taught by their french main chefs whom expertise from cuisines to desserts. Plus, main ingrediants are fresh, imported, top quality and very much worth which is included the fees you paid for. It's a step by step guidance with assistance chefs to monitor your performance and guide you personally. The chefs are precised, perfectionist and gives detail instructions. Kitchen utensils are all provided and the staffs will help out with all the washing and cleaning as well. You can even take away your prepared dish home and share with your friends and family ! 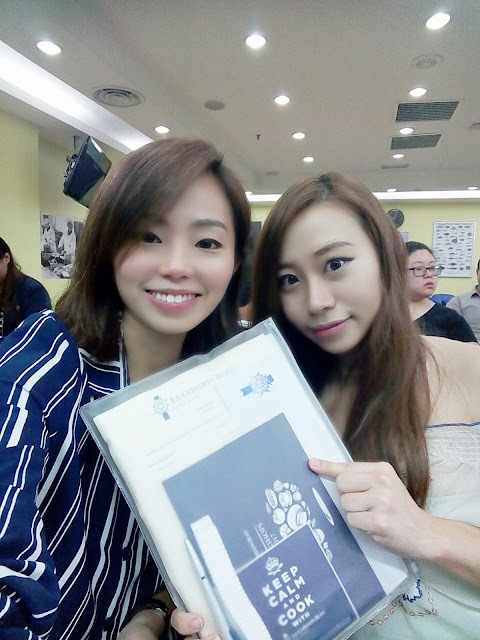 Lastly, you will not only get a nice folder, apron and towel of le cordon bleu and most of all a recognition certificate from Le Cordon Bleu ! My a day with Le Cordon Bleu Workshop started off early. because I had never cooked a Lobster dish ever ! For only RM630, the class was suppose to start 10am and end at 2pm. there were usage of liqours and wine in this dish. I arrived 9.45pm and ended the class at 4pm instead ! My estimation of their ingrediants cost would totally be half of the price and the extra hours of teaching by Chef Rodolphe Onno made it seemed priceless. He was so caring, helpful and very patient which result in a delay of our cooking. First, I registered at lower ground and collected my folder which includes the hair net, cooking hat , apron and also towel !! We then proceed to their demo room where they prepared light refreshments which was a surprise ! Sandwiches and some local delicacies, coffee and tea. I find it interesting to see how they even have a special computer like this that looks like a game ! Since we were early, we had the time to mingle and get to know those whom attend this workshop as well. One of them was even a chef from Iran !! the Miss Petite Spokesperson 2nd Runner Up, Ms Litsan Chong ! Chef Rudolphe Onno came in and taught us how to wear the apron, hair net, towel and also the cooking hat. Our belongings were places in their cabinet in the kitchen itself. Safe and sound ! sure was a fiesty one and after cooking it, it even has a beautiful coral in it's head ! He even said that the this coral can be prepared into another dish. How well informed and knowledgable. Getting the lobster off it's shell was surely a tough task but his method of deshelling the lobster made it looked super easy. The utensils in their kitchen were surely fancy as we only used this huge oven which not only can steam but also bake and place in all our lobsters. Each of us even had our own Kitchen aid blender on our desk ! I got my Lobster steamed and ready to crack it up nicely. Chef Roldoplhe sure has a very strong arm and thick fingers cause even cutting or cracking this lobster is so painful. Parts of the body were spikes but thankfully, the chef assistance were there to help me out with my lack of strength, height and technique. If you have short term memory like me, there is also a paper of recipe hanging in front of us refer to. Otherwise, just ask the others whom has better memory. During the teaching demo process, the Chef was showing us the technique and explaining why would he do this. For example, burning a cognac like this. His explanation makes so much sense and it helps out in future my reference for cooking ! understanding it, then apply this at home in making other dishes. I had no idea burning the alchohol would take away the alcohol. Hmm I probably didn't pay much attention in school afterall. Well, kids don't play with fire but we adults have fun seeing how it burns without burning the dish. In my mind, I assumed the Ravioli would be done but no, we actually learnt how to make from scratch by cooking the fillings and even how to fold them. tast compared to the rest ! All together, we learnt more than just the recipe, but techniques of cutting, cracking the lobster nicely, dishes and ingrediants that blends well with seafood recipes, techniques of boiling soups or bisque, making sauces from scratch and lastly, we were even able to make some friends through this fun workshop sessions with other 10 whom has joined this class as well ! I love how when Chef Rudolphe says: Voilla ! and there, our Lobster cuisine is finally read to be served. Pan fried Lobster tail with vegetable cannelloni drenched with delicious Basil bisque sauce with a touch of baked parmesian. Rich Lobster Bisque Soup with Lobster arm. And since, some would prefer to take away for their dinner and sharing with their families. The Chefs and team had even prepared for us a tasting pallate of finger food of what we had cooked ! It was heavenly delicious !! My favourite is definitely the main dish. Lobster tail with their basil bisque sauce. 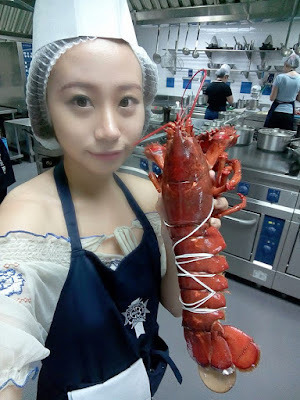 I had no idea we could prepare a dish where you can still taste the lobster as well as a sauce that blends so well with it enhancing it's aroma and taste. But it's not that hard to understand after awhile and he makes me feel like I'm learning in Paris. how much he cares for us, to learn and understand. Even we had some time strain but he was will so patient to work overtime just to teach us. A teacher, master dedicated to teach till the students understand and not bringing the class fast through like a Shinkansen train. *There was a case a student burnt his dish and guess what Chef did ? He threw the burnt dish and helped him recook it all over again, guiding him step by step. Imagine if it was Gordon Ramsey, that guy would pee in his pants right now. *Even when a student had to leave early, he insisted on her staying hoping she can learn all of cusine. Unfortunately, she couldn't but then he offered to pack all her ingrediants and so that she may go home and follow the recipe to try out on her own ! How caring of him ! I saw the Chef literally doing all the packing himself without asking the helpers to help him out . your students are very lucky to have you. since I had graduated long time ago from my University. And also Thanks to all the handsome young kitchen helper Alvin whom helped me when I had not much strength to crack open the shell, or carrying heavy pots, got me a plaster cause I cut my finger and some ice when I burnt my finger and even teaching me how to slice and chop correctly. I am super greatful for their help !! Obviously, I had a very positive, good impression on Le Cordon Bleu in just 1 day workshop. I believed the other chef instructors for other workshops would be the same as well ! It's so worth it and in this year 2017, can you imagine that you can also take various workshops like I did ?! for another Handling Heavy Weightsof the sea : Crab. to learn 3 quick 3 course elegant meals !! Plus, it's inclusive of GST too ! These chefs will have their summer breaks on July and then commence more classes in August , October and December ! Sign up Up to 4 Classes and get 15 % on total bill ! Here below are the workshop information of Le Cordon Bleu I got for this year 2017 ! During June, August, October and December, the Le Cordon Bleu 2017 Workshops Marathon is of 4 to 6 hours per session. There is also a great varieties of workshops to choose out of fruits, vegetables, meats, seafood and even foie gras ! Participants being awarded with the Le Cordon Bleu certificate for this workshop too is totally making this workshop much more worth it. I'm so proud to say that I got a Le Cordon Bleu certificate and now can make a cuisine with Lobster. even have a Vegetarian cuisine Workshop which is prefect for those vegetarians out there ! 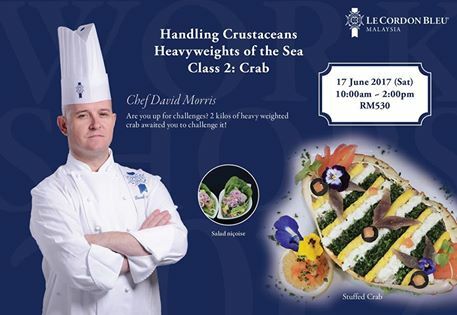 And this class again by Chef Rudolphe Onno is so tempting isn't it ? Foie Gras is such a cuisine delicacy !! For More info of their workshop. Where will this Workshop be conducted?